Experience Degustabox at 50% off! Use Code: D444I and pay just $9.99! Degustabox is a subscription service offering a surprise package of 10-15 consumer goods each month. 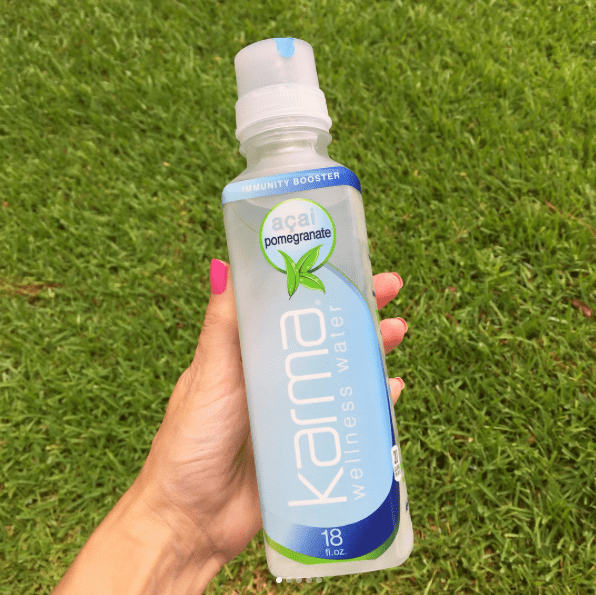 The highlight of this month’s box for me was the Karma Wellness Water. I think this product is so cool and tasted delicious. You peel back the top and push a button to release vitamins into the water. Give it a shake and the flavor and goodness blends for a refreshing treat. I’m a Mrs. Thinster’s fan so I loved seeing that bag of Brownie Batter cookie things. Their cookies are the perfect sweet snack. I haven’t tried the King Arthur’s chocolate chip cookie mix yet but can’t wait to make a batch with my daughter. Wise Foods popcorn is a great snack on the go with sea salt or Cinnabon flavors depending on your mood. My husband stole by Vermont beef and pork sticks to nibble on at work so I’ll have to ask how that went. I think he’s becoming a bigger Degustabox fan every month. We make a lot of Italian food in our house so I loved seeing Goya extra virgin olive oil and Mutti’s tomato sauce. Time to whip up some chicken parm! The WaffleWaffle looks yummy. I make breakfast in the morning for some mommy and me time but will definitely have to give it a try next time I have an early morning appointment and need to breakfast on the go! If you’re looking for a way to try out some new products and get a fun surprise box every month, I’d give Degustabox a try and see what you think. For more information or to order, visit Degustabox. Experience Degustabox at 50% off! Use Code: D444I and pay just $9.99!